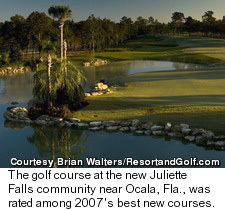 Juliette Falls southwest of Ocala, Florida, isn't your parents' stiff golf community. It boasts a laid-back atmosphere and its golf course, which has been saluted by Golf Magazine, should add to real estate values. 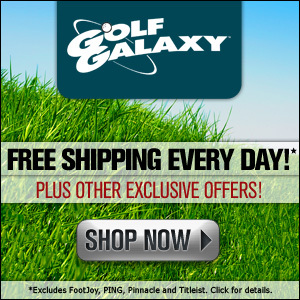 DUNNELLON, Fla. - There is a revolution underway at America's private golf clubs. Fleeting are the days where the measure of a club is in its formalities: strict dress codes or highbrow rules and regulations. More and more of today's prospective members like to kick it casual. 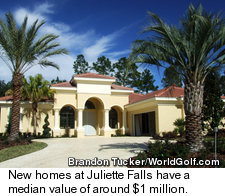 So despite offering all of the high-end facilities and a manicured, championship golf course that could command that exclusive, elitist atmosphere, the new Juliette Falls golf community about a half hour southwest of Ocala opts to remain more low-key. "I would describe [the atmosphere] as high-end casual," said Tom Cioffi, director of operations at Juliette Falls. "Our mission statement is to be comfortable, peaceful, relaxing and fun. Residents won't be staunched with rules like at a traditional country club." Established in the fall of 2007, Juliette Falls is buying into the fact that the country club community isn't for your "Bushwood Country Club" type anymore. Today's demographic is more family oriented. The community's location, somewhat remote about 15 miles from I-75 outside Ocala, fits the mission statement's bill. "We're not in the middle of a metropolitan area on purpose," said Cioffi. "We're out in the country but with bigger cities close by." Orlando is about an hour's drive south, while Jacksonville and Tampa are a little farther away. But being in the beautiful Ocala countryside comes with many pluses, like a large nature preserve for residents to enjoy. The 136-acre reserve on the south side of the property features five miles of groomed trails for hiking, biking, walking and nature watching. Aside from the nature preserve and golf course, amenities will include a spa, swimming pool, tennis and Romeo's Restaurant with chef Rick Alabaugh. There are 12 master plans and four amenity levels. Currently, over 30 homes and 700 home sites are under construction with estimated median prices in the $1 million range. "It was unbelievable to me that the course was so young," said Hoch. "It looked like it had been there a long time. I really enjoyed the course." The course was designed by John Sanford of Sanford Design, which has had a hand in over 60 projects worldwide, including in Japan, Egypt and Canada. The four man-made water features are a nice touch at Juliette Falls and should add to the new golf community's real estate values. But the rolling, forested land is appealing enough on its own. Florida golfers used to flatter grounds farther south towards Orlando and south Florida will revel in the many undulating holes, from the uphill, dogleg 10th hole to the straightaway, tumbling 450-yard 18th. Perhaps the finest stretch of holes comes in the middle of the course, beginning at the sixth, a par 5 named "Reflection Lake." It features a tee shot over the aforementioned lake before playing uphill to an elevated green. After that, "Oasis" is perhaps the most beautiful hole on the course, featuring a dazzling water structure adjacent to the green. A long and then a short par 4 on the eighth and ninth holes, capped by a potentially drivable No. 9, make for an exciting collection. The practice facilities are expansive, with a driving range and multiple putting and chipping greens. 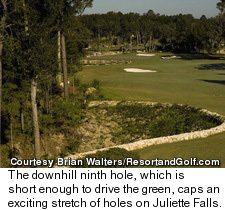 Juliette Falls is currently open to the public during their membership drive, and non-members may make tee times three days in advance. Green fees for the public are $125.